It’s so easy to feel jaded about Disney’s entertainment empire, where everything seems to be an advertisement for something else. Love the movie? Why not see the stage show/buy the soundtrack/ take the theme park ride! And yet, almost every time I sit down to watch a one of Disney’s animated films on home video, I get sucked in. Yeah, it’s commercial art, but it’s top-notch, entertaining stuff. 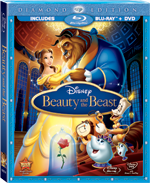 Having exhausted the precious metals, Disney offers Beauty and the Beast in a Diamond Edition Blu-Ray/DVD combo pack, loaded with bonus features that added to my appreciation of the film. The Little Mermaid brought Disney back from animation purgatory in 1989 and set the template for future animated films (a young person yearning for adventure, Broadway musical-style songs). Composer Alan Menken and lyricist Howard Ashman, who won Oscars for their work on Mermaid, returned for Beauty and the Beast. Their lively songs provide the bones for story. The bonus features tell of a production that was full of hurdles. The original director was fired after several months of work had been done. Ashman, who not only wrote the lyrics but contributed to the development of the story was terminally ill, and died during production of the film. A live-action screenwriter, who wasn’t used to the collaborative process of the animators clashed with the production team. The resulting movie is what you’d expect from a Disney animated fairy tale. There’s romance, peril, slapstick humor, a couple of breathtaking moments and a bit of enchantment. From the dancing furniture to Gaston singing his own praises, it’s fun to watch. In one of the best moments on the bonus features, animator Glen Keane says that animating the scene where the Beast transforms back into a human was a spiritual experience for him. In the midst of cross-promotions and dancing candelabras, here is an artist with passion. Good for him, and good for Disney. Disc one has three versions of the movie. Purists can check out the original theatrical release, which is 85 minutes long. The extended edition (91 minutes) was released in IMAX format in 2002 and has a song, Human Again, that was cut from the theatrical version. The storyboard edition plays as a picture-in-picture to the theatrical edition. The other interesting extra on disc one is Composing a Classic (20 minutes), in which composer Alan Menken talks to producer Don Hahn and Disney historian Richard Kraft about his creative process and working with Ashman. There are two deleted scenes with introductions. Both scenes are montages of drawings and rough animation. There is no “play all” option for this section. Broadway Beginnings (13 minutes) plugs the stage version of B&B. A new music video of Beauty and the Beast rounds out the first disc. The real meat of bonus features is on disc two. Beyond Beauty: The Untold Stories Behind the Making of Beauty and the Beast (53 minutes). Just about everything you wanted to know about the movie is in here. One of the extended features is a nice tribute to Ashman, though it curiously avoids mentioning that he died of AIDS. Want more? Every so often, a window pops up on the bottom of the screen. Press “enter” on your remote, and you’ll be seamlessly transitioned into additional material. One window takes you to some of Disney’s earliest cartoons (Laugh-O-Grams) that were based on fairy tales, others lead to deleted scenes and galleries. Pressing the “pop menu” button while Beyond Beauty is playing brings up a directory of all of the embedded features. You can then navigate to specific features, as well as specific segments of the main feature, with the remote. The disc also keeps track of which features have been viewed. Though multiple access points to the features are provided, I had technical difficulties. Of the four Laugh-O-Grams, I was only able to play the first one. When I tried to select other ones, they simply wouldn’t play. In the image gallery feature, I was unable to navigate out of the galleries. The problem may be with my machine, rather than the disc, but if you have the same machine as me you might have the same problem. Also on disc two is a selection of features from the 2002 DVD release. Many of the segments feature in-progress animation. The best of these is some rough pencil animation (13 minutes in all), including the transformation scene. The single standard DVD has the extended version of the movie, a singalong feature and the audio commentary. A two-disc DVD set will be released in November, 2010. The Blu-Ray is presented in a 1.78:1 aspect ratio. The image is flawless and subtly superior to the excellent image on the standard DVD. The Blu-Ray sound is English 7.1 DTS-HD and sounded great on our five-channel system. The DVD has Disney’s Enhanced Home Theater Mix 5.1. Both the Blu-Ray and DVD offer subtitles in English, Spanish and French, as well as Spanish and French language tracks. Watch the movie; you might as well choose the extended edition. Switch to disc two and check out Behind Beauty. Use the pop-up menu and pick out the embedded extras that appeal most. Go back to disc one later. Check out the commentary and Composing a Classic.